As one of the United Kingdom’s best-known pranksters, Simon Brodkin is well versed in the art of infiltration. Without subterfuge, he would never have gotten close enough to the former soccer boss Sepp Blatter to shower him with fake dollar bills as he did during a 2015 news conference to protest Blatter’s alleged corruption. Nor would Brodkin, a London Jew who often performs as Lee Nelson, have been able to gain the access necessary to disrupt Kanye West’s concert that year in Glastonbury by jumping on stage with him. And he certainly wouldn’t have been able to crawl under a Volkswagen car during an auto show presentation last year in Geneva while wearing a company uniform to install what he explained in German-accented English was a “cheat box” — a reference to the scandal around the firm’s use of doctored software to fake emission readings from some of its vehicles. But Brodkin needed a whole new level of chicanery for his latest and most elaborate prank yet: Secretly filming himself nearly making it as a contestant on “Britain’s Got Talent” by pretending at auditions to be an orphaned, patriotic rabbi who liked to rap but wasn’t very good at it. His goal, as he described it: Prove once and for all that it is a “contrived,” shallow show that is not about talent at all. Before reconnecting to his Jewish roots for the prank, Brodkin worked out a formula that he hoped would help him sail through the audition process even though he has neither interest in rapping nor any apparent talent for it. All he needed, Brodkin said, was a sob story, an unexpected act and a patriotic message. If you have those, then “whatever rubbish you perform for the judges, they will tell you it was the most incredible performance they have ever seen,” he said in a documentary about the prank aired on a British television station earlier this month. “Without that hype, the millions of viewers watching as home just might start to notice just how devoid of talent the acts actually are,” he added. In January 2016, wearing a fake beard and side locks and presenting himself as Steven Goldblatt, Brodkin used a hollowed-out boom box to film himself advancing from interview to interview, and from audition to audition, with a half-baked routine comprising patriotic clichés. But after reaping praises from the four-judge panel at the final audition in London, a production assistant finally recognised Brodkin, which kept him off the air. The weeklong deception required Brodkin not only to channel his inner Orthodox Jew, but also to devote much more time and effort than he initially had allotted for the project, he said. “This was more a long con thing, which I hadn’t attempted before, so rather than just in and out, which is normally the thing I do, I wanted to see whether I can get in, get undercover, and last for as long as possible,” he explained on the documentary shown on Channel 4. 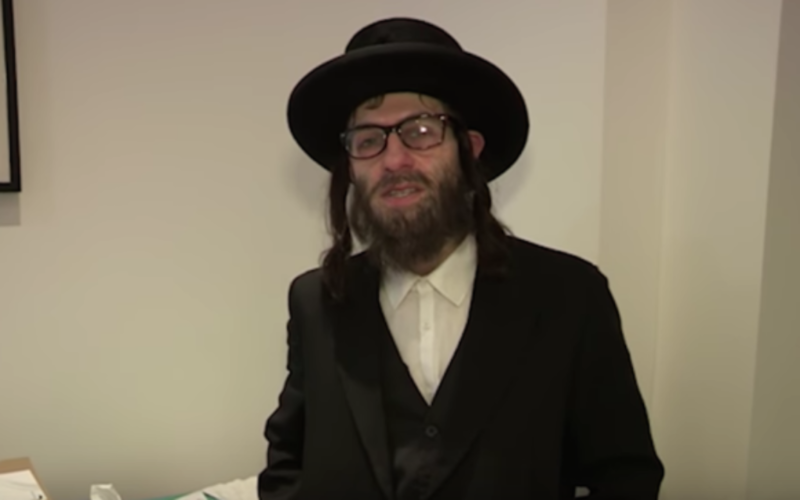 Impersonating a member of the haredi community, which is hardly known for partaking in popular culture in Britain, allowed Brodkin to stand out among the other contestants, he explained. “Us Jews are not particularly renowned for rapping,” he said. Brodkin got his wish after he delivered his routine draped in the U.K. flag, which he filmed despite a warning that security will “break any camera” used by contestants. The panelists ate up the elementary school-level performance, including Cowell. Though he didn’t make it on the show, Brodkin still thinks he proved his point.